Find out about the best beaches in Florida; they come in all kinds! From the boardwalk at Daytona Beach, to the quiet and beautiful Captiva, you’re bound to find the best Florida beaches for you. You’ll also see plenty of pictures, from Destin down to the Key West beaches — and everywhere in between! You know you’re curious about them…but find out what you need to know before you sign up for one of the many Florida vacation packages — choose the right one for you (Psst – you can also find vacation packages to Orlando Florida)! All Florida vacation packages are not created equal, so discover what you need to know before signing on the dotted line. 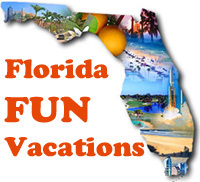 Are you looking for a Florida family vacation? I’ve got just the thing for you — ideas for Florida vacation spots for families! You’re bound to find at least some of the ideas intriguing for your next vacation. The Florida Keys is a wonderful Florida vacation spot — or more precisely, a vacation destination. Do you like snorkeling, swimming, boating, diving and more? What about finding places to stay and attractions to see? Here’s plenty of information about Florida Keys vacations and Key West to get you started! Need some romance in your life? I’ve got ideas for you and your “special someone” for some romantic Florida vacation spots all around the state! Walt Disney World vacations — visit with the world’s most famous mouse. And as you will see, there is more to Disney than meets the eye! Tickets, parks, resorts – they’re all here. We can’t forget the Universal Studios theme park, with its wonderful rides and shows. Plus, there are all kinds of other, smaller Florida attractionsthat never seem to make it into the guide books. Florida State and National Parks – the Florida Everglades is a must-see. And some of our state parks are beaches! There are 2 parks that are mostly underwater – how’s that for interesting? Oh, and don’t forget our “wonder down under” — Florida Caverns State Park! A recent addition I’ve made is Blue Spring State Park — lots of info and pictures! Florida cruises — all kinds, from the mega-ships to intimate vessels await you! Maybe sunset cruises in the Florida Keys? Want to walk on the wild side? Florida camping is out of this world…although there are definite “seasons” for the various camping locations! Hey, have you considered where you’ll stay here in Florida? How about renting a timeshare and vacation in luxury!Other possibilites? How about Orlando vacation villas? Check out my updated Florida vacation blog — what’s new on this site, and what’s news around the state. Just so you know, I won’t be covering Florida places to party hearty (except by making a general reference). Well, I do include Key West, but that’s a special exception. I’ll be focusing on the smaller attractions, vacation spots like the Keys, as well as places of beauty and wonder around this great state of Florida (although any Florida vacation site isn’t complete without Disney and Universal). It’s the Florida you knew had to be here somewhere! And there are plenty of wonderful Florida vacation spots to explore, from the ordinary to the extraordinary. I take trips around the state from time to time, visiting places both old and new (and taking new photos along the way). I am continually amazed at what Florida has to offer. I hope you’ll be just as delighted as you read these pages.